Chamber Music on the Hill presents "Cool Night Notes"
Cellist Lawrence Stomberg enjoys a wide-ranging career as soloist, chamber musician and pedagogue. He is Professor of Cello at the University of Delaware, and he performs at venues across the United States as a member of the acclaimed Serafin String Quartet. 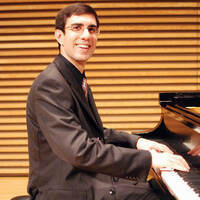 Matthew Brower is a Philadelphia-based pianist, coach, and educator who brings vision and sensitivity to a variety of genres, from classical piano, chamber music, opera, and art song to musical theatre and jazz. He is Lecturer of Piano at Washington College and a member of 6-wire, a trio with violin and erhu acclaimed for its mixture of Eastern and Western styles. Tickets for the concert are $15 for adults and $10 for seniors and military. Children and students with valid ID are admitted free. Concert tickets may be purchased at the door, or online via PayPal; please follow the link at McDaniel.edu/Music/cmoth.html. From Baltimore - Take 695 (Baltimore Beltway) to 795 (Northwest Expressway) to MD 140. Upon entering Westminster, turn left at second traffic light onto Route 97 South. Travel 3.2 miles to fifth traffic light, turn right onto Washington Road (Route 32). Carroll Community College entrance is ½ mile on the right. From Washington, DC - Take 355 North to 495 East (Washington Beltway) to 270 North. Take Exit 16, Route 27, towards Damascus. Follow Route 27 through Damascus continuing through the intersection of Route 26, Liberty Road (approximately 14 miles). Approximately 10 miles beyond Route 26, make a right turn onto Kate Wagner Road. This road ends at the intersection with Washington Road (Route 32). Turn right. The Carroll Community College entrance is ¼ mile on the left. From Frederick - Take I-70 East to Exit 68. Travel northeast on Route 27, continuing past the intersection of Route 26, Liberty Road, (approximately 14 miles). Travel another 10 miles and make a right turn onto Kate Wagner Road. Road ends at the intersection with Washington Road (Route 32). Turn right. The Carroll Community College entrance is ¼ mile on the left. From Gettysburg, PA - Take Route 97 South to MD 140 East. At sixth traffic light, turn right onto Route 97 South. Travel 3.2 miles to fifth traffic light, turn right onto Washington Road (Route 32). The Carroll Community College entrance is ½ mile on the right.